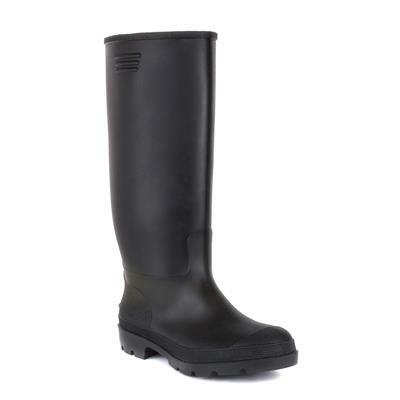 These black wellington boots are ideal for fun afternoon’s splashing in puddles or pottering about in the garden. They display a round toe, black upper and tab to the side for easy pull on and a chunky gripped outer sole keeping safe on all surfaces. I normally take a size 7 but found them too large, so purchased size 6 which fits really well and still room to tuck your trousers in or can put the wellie underneath trousers with no problem. They have a little ridge on the back of the heel, so you can take off using your other foot to hold them down which I find very useful. Not worn them out yet, but so far is good. Having been let down by another store, when their 'next day delivery' failed to arrive - I had to hurried arrange for another pair of boots for a trip. I ordered from Shoezone, and within an hour they were ready for collection. The boots were good and served the purpose well - and got through a wet mine in the north f England.